Ever feel that you need an immediate INTERVENTION when it comes to your job? If there is such a thing as First Aid for a miserable job, this book is it! Research on job satisfaction consistently reveals that a majority of Americans are not satisfied with their jobs, while chronic diseases linked to stress continue to rise across the adult (working) population. Since most adults will spend the majority of their viable years at work, with 8 to 12 hours each workday dedicated to the job (or the commute to and from the job); the cost of job misery is significant and personal. While there will always be room for improvement in managerial behavior along with organizational structure and policies, the truth about job satisfaction is that it starts in the mirror. No company policy rewrites or manager retraining can alter the personal perspective, and it's that perspective that determines whether there is contentment or misery at work. 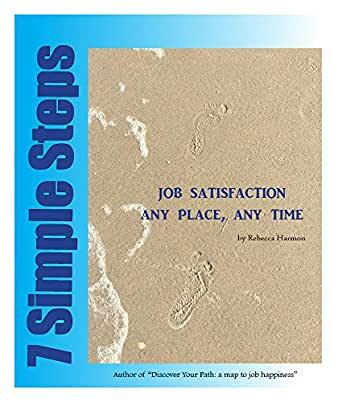 Taking cues from self-help, positive psychology and grandma's old-fashioned common sense, Rebecca Harmon's second book on career satisfaction provides a simple approach to transforming job misery into job satisfaction, regardless of a person's status in an organization or career longevity. The process outlined in 7 Simple Steps does not require a resume, cover letter or interview and it is applicable across industries, professions and levels of educational attainment. Significant life changes require an investment of time and a commitment to the process. This book provides a straightforward guide to shifting from the dread of Monday morning to a more peaceful coexistence with the realities of the work week. Before you hire a career coach, buy this book and work these 7 steps. If you don't love your job you owe it to yourself to give this a try.